In this research, different active phytochemical constituents present in Cleome heratensis (C. heratensis) from Capparaceae family were investigated. Moreover, the fatty acids present in the seed and aerial parts of the plant were identified by gas chromatography (GC) after esterification of the oil. Antioxidant activity of the aerial parts and seed of C. heratensis methanolic extract over 2,2′-diphenylpicryl-1-hydrazyl (DPPH) was investigated using ultraviolet–visible (UV–Vis) spectrophotometer. To study total phenolic compounds and flavonoids, the plant was extracted from ethanol by ultrasonic method, then further extracted with other solvents. Amounts of anthocyanins and tannins/condensed tannins were determined by their corresponding ethanolic and acetone extracts. Antioxidant activity of the plant species was studied by a spectrophotometric method using 80% methanolic extract. The high content of phenolics as 16.915 mg tannic acid equivalents per gram of dry matter (TAE/g DM), tannins (12.231 mg TA/gr DM) and condensed tannins (4.086 mg TA/g DM) was obtained for the C. heratensis extract. The most flavonoids content was found 4.444 rutin equivalents (in mg) per gram of dry matter (mg RE/g DM) in plant’s aerial extract. The most amount of anthocyanin (0.48 mmol/gr WM) was observed in flowering stage. Antioxidant activity of the aerial parts and seed of C. heratensis methanolic extract were 11.92 and 63.54 mg/mL IC50, respectively. High level of phenolic components including flavonoids, proanthocyanidins and tannins was detected in the extract of aerial parts of the plant. The oil of seed of this plant is a rich source of saturated and unsaturated fatty acids. Finally, C. heratensis aerial part extract was found as an excellent natural antioxidant. Natural products contain different valuable chemical components such as phenolic compounds, phthalides, phenylpropanoids, terpenoids, essential oils, aromatic compounds, alkaloids, alkynes, sterols, polysaccharides, fatty acids, anthocyanin, tannins, etc. (Oksman-Caldentey and Inze 2004; Picot et al. 2017; Mollica et al. 2015). They also have significant antioxidant activity (Embuscado 2015). Knowledge of these components in a plant not only helps for the quality control analysis of the plant but also manifests nature of the drug or formulation (Jain et al. 2011). Phenolic compounds are one of the important groups of secondary metabolites of natural products that have a large diversity of structures and functions including water-soluble (flavonoids, phenolic acids, quinones, phenyl propanoids) and water-insoluble compounds (tannins, lignins condensed, cell-wall bound hydroxycinnamic acids) (Alu’datt et al. 2017; Mocan et al. 2016; Quispe et al. 2012; Nile et al. 2017). In this way, various biological effects have been found for phenolic compounds; they are known as antioxidants that could be served as free radical scavengers and protect oxidative damages (Zhu et al. 2017; Sreelatha and Padma 2009; Rauter et al. 2012; Haminiuk et al. 2012). Anti-inflammatory (Ambriz-Pérez et al. 2016) and antidiabetic (Ghorbani 2017) effects are another biological activities of phenolic compounds. Tannins are one of the most important classes of polyphenols that are found in fruits and plants (Rauter et al. 2012). They are mostly present as phenolic polymers. Two main types of tannins are condensed and hydrolysable. 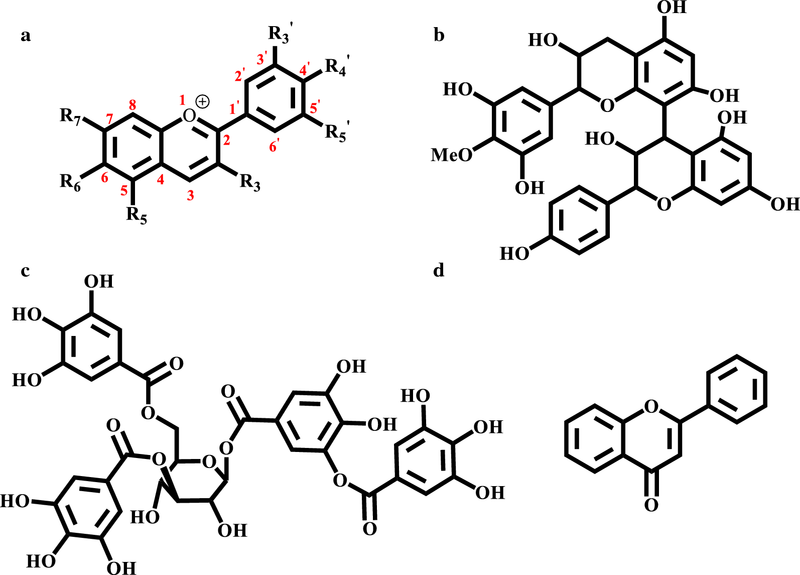 Gallotannin or tannic acid is a type of hydrolysable tannin in fruits (Maia et al. 2017; Ma et al. 2017). Anthocyanins are another class of flavonoids and the largest group of water-soluble natural pigments belonging to the polyphenolic family. They are responsible for the colors red, violet, and blue for many fruits, vegetables, and cereal grains (Hosseinian and Beta 2007). Theses bioactive molecules are widely spread in plant food. They show useful health effects, radical scavenging, chelation of heavy metals such as copper, zinc, and iron (Prior and Wu 2006; Ma et al. 2018). The chemical structure of the major compounds in a natural plant is shown in Fig. 1a–d. Fatty acids (FAs) are another class of bioactive compounds that make up an important part of the human diet (de Koning et al. 2001). They could be classified into unsaturated and saturated fatty acids, which both play an inevitable role in human health and nutrition (Smith et al. 2013; Xiao et al. 2012). Also, poly-unsaturated fatty acids (PUFAs), as a health-supporting nutrients, have the unique medicinal and preventing properties toward inflammatory, heart diseases, atherosclerosis, autoimmune disorder, diabetes, eczema, dermatitis, asthma, rheumatoid arthritis, atherosclerosis, diabetes, obesity—even cancer and other diseases (Belch and Hill 2000; Leventhal et al. 1993; Sierra-Cantor and Guerrero-Fajardo 2017; Kaurinovic et al. 2011; Xiao et al. 2012; Ramadan et al. 2006). From this viewpoint, identification of total fatty acids and lipids in plant seems to be essential. So, isolation and identification of these bioactive compounds in a plant are of utmost importance leading to further biological and pharmacologic investigations. 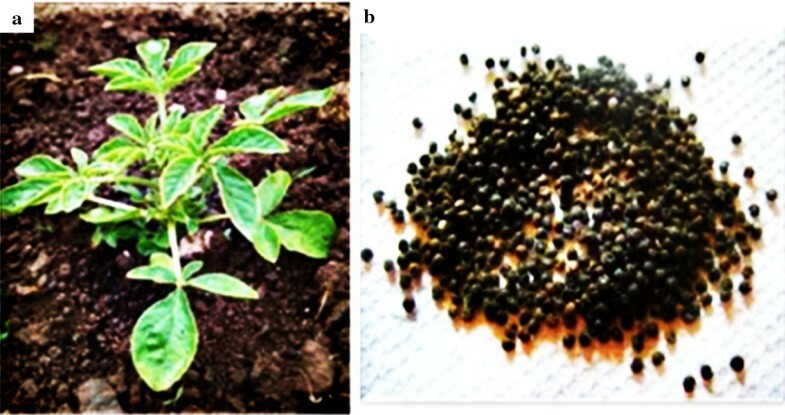 These study might be served for developing the herbal drug that requires the isolate novel bioactive compounds from the medicinal plants, which may open a new route to cure various irremediable diseases such as diabetes and hepatitis (Azmir et al. 2013). Cleome heratensis (C. heratensis) belongs to Cleomaceae family that includes more than 170 species of shrubs, herbaceous annual and perennial plants (Asemaneh et al. 2006). The genus C. heratensis is a flowering annual herbaceous plant which is typical of warm temperate areas during summer and autumn. Its well-known species include spider flowers, spider plants, spider weeds or bee plants (Pakdaman et al. 2013). The germinating, flowering and fruiting stage of this plant are in May, September and October, respectively (Ghaderian and Baker 2007). Various biological activities have been known for different species of Cleome (Singh et al. 2018), such as anti-microbial and insecticidal activities (Williams et al. 2003), anti-inflammatory (Puchchakayala et al. 2008), antioxidant (Narendhirakannan et al. 2007), hepatoprotective (Gupta and Dixit 2009). The aim of this research is focused on comprehensive assessment of phytochemical and fatty acid composition as well as antioxidant activity of different extracts from roots and aerial parts in different phenological periods of C. heratensis. Aerial part, root, and seed (Fig. 2) of C. heratensis were collected in late September and October 2014 from South Khozestan, Birjand, Iran at four stages of growth including: vegetative (S1), pre-flowering (S2), flowering (S3) and fruiting stage (S4) in May, early September, late September and October 2014, respectively. They were identified in the Herbarium of Agriculture Institute, Mashhad, Iran (Herbarium number: 5413). All the chemicals were of analytical reagent grade purchased from Sigma Aldrich and used as received without further purification. Folin–Ciocalteu’s (FC) phenol reagent, sodium carbonate anhydrous, sodium hydroxide, polyvinyl pyrrolidone (PVP), hydrochloric acid, acetate sodium, aluminum chloride hexahydrate, tannic acid, rutin and 2,2′-diphenylpicryl-1-hydrazyl were purchased from Sigma and Merck companies. Gallic acid was purchased from Fluka supplier. Analysis of the fatty acids was performed on a YL 6100 gas chromatograph system with a CBP5 column (Shimadzu 30 m × 0.32 mm × 0.25 mm) equipped with an FID detector. Compounds were separated on a CP-Sil 88 Fused-silica capillary column (100 m × 0.25 mm × 0.2 μm). UV–Vis spectra were recorded on Shimadzu UV-Win X-ma 2000 spectrophotometer at span 20–800 nm. To obtain the fatty acid components in C. heratensis seed, the dried ground seed of the plant (Fig. 2b) was extracted with n-hexane using a Soxhlet apparatus (70 °C, 8 h, 5% extraction yield). After removing n-hexane using a rotary evaporator, the obtained oily mixture was treated with sodium methoxide, according to the Standard ISO 5509:2000 (ISO2000) to produce the corresponding methyl esters by the trans-esterification reaction (de Souza Schneider et al. 2004). Briefly, a drop of the obtained oil was dissolved in n-heptane (1.0 mL) and then, sodium methoxide (50 μg) and water (100 μL) were added to the mixture. The tube was centrifuged at 4500 rpm for 10 min and the lower aqueous phase was separated after addition of HCl (50 μL, 1.0 mol with methyl orange). Next, 20 mg of sodium hydrogen sulphate was added to the solution and the mixture was centrifuged at 4500 rpm for 10 min. The resultant organic phase was transferred to a vial and injected to GC to identify its fatty acid composition. Aerial parts (Fig. 1a) and stem of C. heratensis were rinsed with deionized water, air-dried at room temperature, then finely meshed and grinded with mortar and pestle, individually. Each plant powder (3.5 g) was extracted with ethanol (80%) into an ultrasonic bath for 7 min. The extracts were filtered, and the solvent was evaporated at reduced pressure. The yield of extractions was found 6% and 4% for the aerial and stem of the plant, respectively. The ethanolic extract was successively further extracted with four solvents with increasing polarity (Et2O, CHCl3, EtOAc and n-BuOH). All five extracts were evaporated to dryness and then dissolved in 50% ethanol to make 1% (w/v) solutions. The amount of total phenolic content of the extracts was determined using the Folin–Ciocalteu colorimetric method according to the previously reported protocol (Chandra et al. 2014). Briefly, the method was performed by addition of 0.6 mL distilled water and 0.2 mL Folin–Ciocalteu reagent (0.5 M) to an aliquot of plant extracts as well as standards. The mixture was stirred vigorously for 15 min and then, a solution of sodium carbonate (1.0 mL, 8% w/v) was added to the mixture. The mixture was further diluted to 3.0 mL and set it aside for 30 min; then, the absorbance of the resulting blue-colored solution was measured at 760 nm. Quantitative determination of phenolic contents was performed based on the calibration curves of the standard samples with concentrations ranging from 20, 40, 50, 80 and 100 mg/L of gallic acid in 50% ethanol. The results were expressed as gallic acid equivalents (GAE) in milligrams per gram of dry plant material weight (mg/g). The total content of flavonoids was measured quantitatively using rutin as a reference, according to the described procedure by Bousselsela et al. with a little modification (Brand-Williams et al. 1995). Briefly, in a dry tube, 1.0 mL of aluminum trichloride solution in 50% ethanol along with 3.0 mL sodium acetate (10% w/v) was added to the plant extract (1.0 mL). Then, the absorbance was recorded at 415 nm after 40 min of the mixing. Also, the absorbance of a reference solution, which was prepared by 1 mL of rutin solution instead of the plant extract, was read simultaneously. Rutin solution was prepared with addition of 10 mL of 50% ethanol to 0.005 g of dried rutin. Quantitative determination of flavonoids contents was performed using standard calibration curves using various rutin concentrations of 25, 50, 100 and 250 mg/L. Finally, the flavonoids concentrations were reported as rutin equivalents in milligrams per gram of dry plant material weight (mg RE/gr DW). 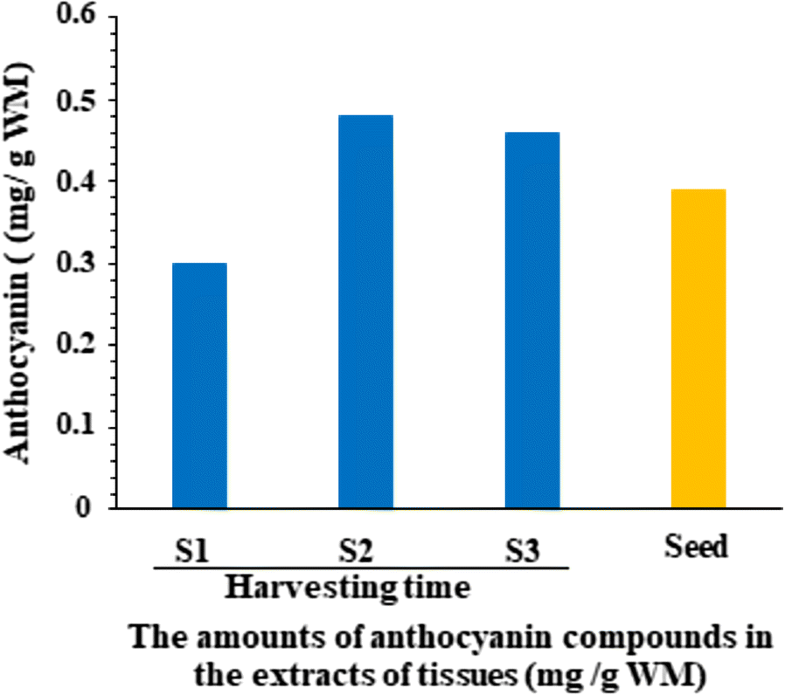 Analysis of anthocyanins was conducted according to the method described by Hara et al. (2003). The fresh parts of C. heratensis (0.2 g) were extracted by rubbing with 3.0 mL of acidified methanol (MeOH: HCl; 99:1, v/v). The crude extract was centrifuged at 6000 rpm for 30 min and set it aside in dark (covered with an aluminum foil) overnight (yield of extraction: 1.1%). The absorbance of the supernatant was recorded at 550 nm to detect anthocyanins. The total tannins were determined using the three steps method reported by Makkar et al. (1993). Firstly, powdered samples (200 mg) were extracted with 70% acetone. The yield of extractions was found 5%, 4% and 6% for aerial, root and seed of the plant, respectively. The extract was centrifuged at 3000 rpm for 5 min and then filtered. The first step involves the preparation of calibration curves of the standard samples with concentrations ranging from 20, 40, 50, 80 and 100 mg/L of tannic acid in 50% ethanol. In the second step, the mixture of extract (1.0 mL), distilled water (1.0 mL) and PVP (0.1 g) was shaken for 5 min, incubated for 10 min at 4 °C, and then centrifuged. The total phenolic compounds without tannins were also determined by standard calibration curves of tannic acid. At last, tannins were determined by the difference between total phenolic compounds before and after the addition of PVP. 200 mg of powdered samples (aerial, root, seed) was extracted with 70% acetone followed by ultra-sonication at 3000 rpm for 20 min at room temperature. Then, the extract was centrifuged for 10 min at 3000 rpm. The supernatant was collected and kept on ice. The yield of extractions was found 5%, 4% and 6% for aerial, root and seed of the plant, respectively. The dry matter was determined according to the following procedure: Sample (5 g) was placed into an oven adjusted at 100–105 °C to complete drying and to reach a constant weight. After cooling to room temperature, weight of the dried sample was recorded and then, % dry matter was calculated by the following formula: Dry matter (%) = W2/W1 × 100, where W2 and W1 are mass (g) of the sample before and after drying. Approximately, 0.15 g of dried parts of C. heratensis with 3 mL of 80% methanol was extracted at ambient temperature for 45 min under an ultrasonic wave. Then, the extracts were kept in the dark for 15 min and were centrifuged for 15 min at 5000 rpm. After centrifugation, the supernatants were collected. The extracts were kept at 4 °C in dark until further analysis (yield of extraction: 7%). where Ac and As are the absorbance of the control (consist of solvent and DPPH) and the sample extract, respectively. Methanol and ascorbic acid were used as blank and positive control, respectively. All of the experiments were repeated for three times and their average was reported. The IC50 values were calculated by plotting the inhibition percentage against the concentration of the extract (Muthukrishnan and Manogaran 2018). Different concentrations (1/10, 1/20, 1/30, 1/40) of the aqueous extract of C. heratensis were prepared by boiling 1 g of aerial parts of the plant in 10, 20, 30, 40 mL of deionized water for 5 min. IC50 is the required initial concentration of a selected antioxidant sample (plant extract in this study) to quench 50% of the free radicals in the reaction mixture. The fatty acid composition of oil is a major indicator of oil quality; oils with high percentages of unsaturated fatty acids, mainly oleic and linoleic, are of high quality (Jokić et al. 2013). The fatty acid composition of the C. heratensis seed extract was determined by GC analysis (Fig. 3). The oil content of seeds can be varying from around 1% in rice to more than 55% in Myristicaceae; the oil content in C. heratensis seed extract was found 27.47%. The analysis of fatty acid obtained from seed extract of C. heratensis revealed the presence of over 8 different compounds as shown in Fig. 3 and Table 1. The major components were linoleic acid (67.8%), oleic acid (17.8%) and palmitic acid (8.7%). The results demonstrated that the amount of unsaturated fatty acids (87.8%) was higher than saturated fatty acids (12.2%). The ratio of unsaturated to saturated fatty acids (U:S) was 7.20 in this oil. The fatty acid composition of C. heratensis seed with other edible vegetable oils was compared (Table 2). According to Table 2, the U/S ratio which is obtained for our plant was higher than olive and corn oil. Therefore, considering that the higher ratio of U:S for oil is safer for the heart and blood vessels, it proposes that these seeds are examined for feed intake. More importantly, the amount of linolenic acid, as an essential fatty acid in human food nutrition, was found 67.8%, which is higher than the most vegetable oils (Table 2). The results obtained from the determination of the total phenolic content of C. heratensis extracts are summarized in Table 3. As shown in Table 3, the total phenols content of the C. heratensis extract depends on harvesting time in various solvents. The concentration of total phenols of C. heratensis extracts was measured as gallic acid equivalents in milligrams per gram of dry plant material weight (mg GAE/g DW). The results showed that in most cases, the quantities of phenolic compounds of the plant were increased in different solvents during various developmental stages. 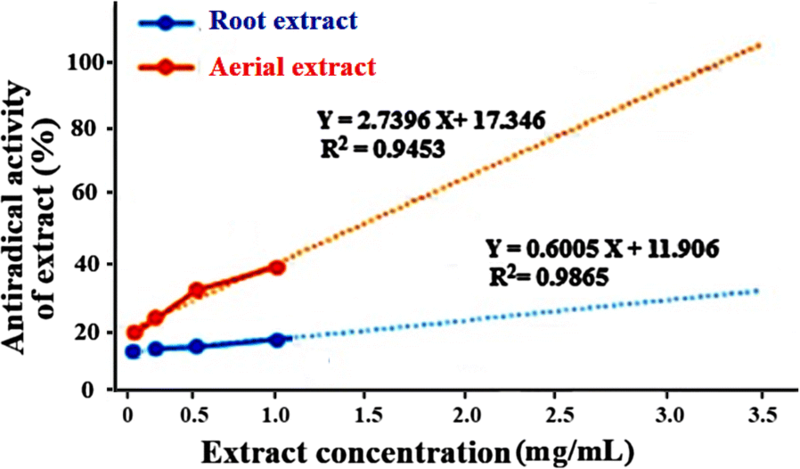 The higher content was detected in acetone extract of aerial part (16.915 mg TAE/g DM) in S4 (fruiting stage) and the lowest total phenolic level was seen in ether extract of the root (0.048 mg GAE/g DM) in S2 (Pre-flowering stage). Also, the highest amount (19.0377 mg TAE/g DM) was observed in the acetone extract of the seed. In general, the highest total phenolic content was detected in aerial parts and extraction by acetone has a maximum output. The concentrations of flavonoids of C. heratensis extract were determined as rutin equivalents in milligrams per gram of dry plant material weight (mg RE/g DW). The results showed that the amount of flavonoid compounds of the plant was increased in different solvents at different stages of growth (Table 4). The highest flavonoids content was detected in n-BuOH extract of the aerial part (4.444 mg RE/g DM) in S4 (fruiting stage) and the lowest content was seen in ether extract of the root (0.003 mg RE/gr DM) in S2 (Pre flowering stage) (Table 4). In general, similar to phenolic compounds, the highest content of flavonoids was detected in the aerial part at fruiting stage. Also, extraction by n-BuOH and acetone provides a maximum output, respectively. As shown in Fig. 4, concentration of anthocyanin of C. heratensis extract was measured as millimole per gram of wet plant material weight (mmol/g WM). 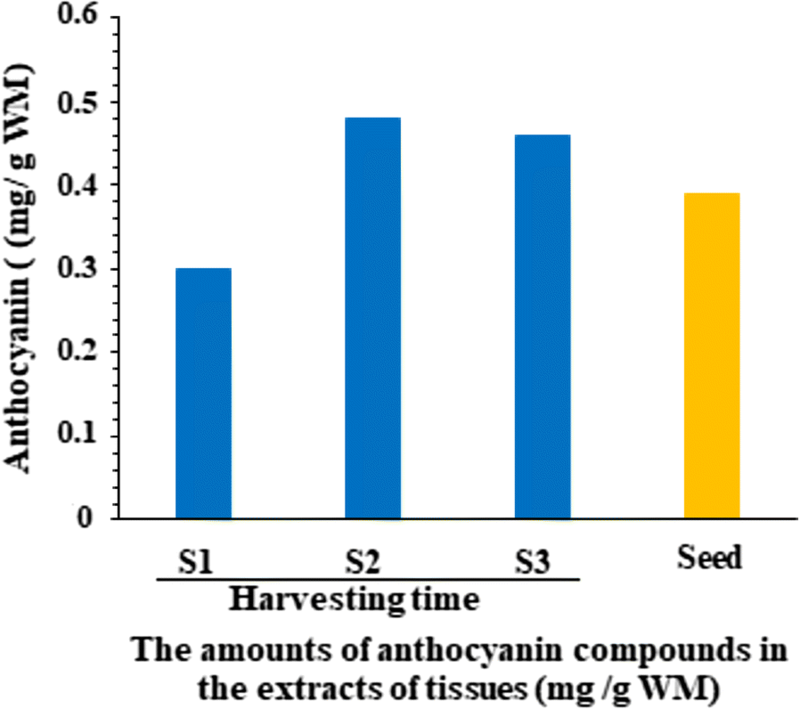 The results showed that in the primary stages, the anthocyanin amount increased and at the flowering stage (S3), it reached to 0.48 mmol/g WM, and then decreased. In general, these results showed that extraction at flowering stage has maximum output due to flowers. Also, seed of the plant demonstrated 0.39 mmol/g WM anthocyanin which is higher than aerial parts of the plant. The concentrations of total and condensed tannins (proanthocyanidins) in the extracts of C. heratensis (mg TAE/g DM) are shown in Fig. 5. The results showed that the amount of tannins in aerial parts of the plant was increased during various developmental stages from S1 to S4. 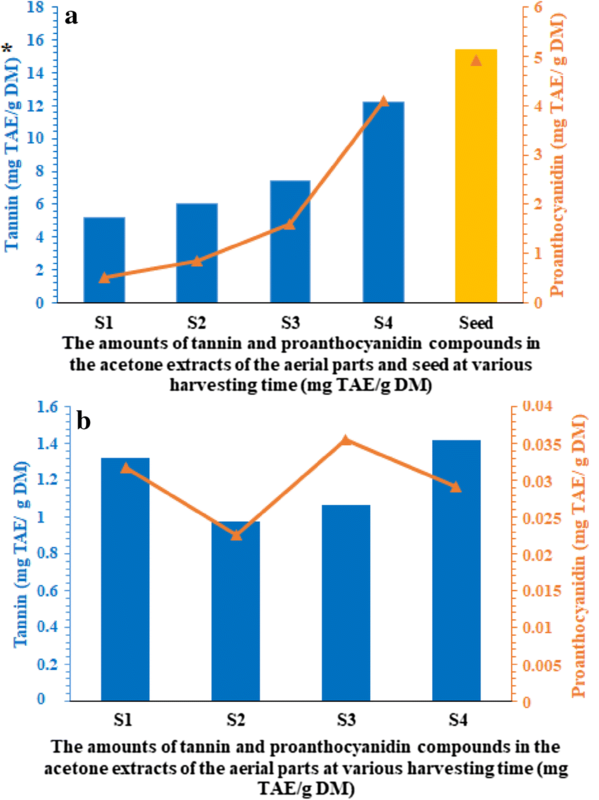 The highest content was detected in extract of aerial part in S4 (fruiting stage) including total tannins (12.2312 mg TAE/g DM) and proanthocyanidin (4.0856 mg TAE/g DM). The lowest amount was seen in the extract of root in S2 equal to 0.9757, 0.0226 mg TAE/g DM for total and condensed tannin, respectively. In general, similar to other identified compounds, the highest contents were detected in the seed. The differential accumulation of phenolic compounds in C. heratensis extracts at the different stages could be related to physiological changes during growth in response to environmental stress. The season, sunlight duration, UV radiation, and temperature are known parameters that affect the plant metabolism, since some compounds may be accumulated at a particular period to respond to environmental changes (Generalić et al. 2011; Negrão et al. 2017; Lu et al. 2017). Antioxidant activity of the C. heratensis extracts was determined using DPPH radical scavenging assay. This assay is based on hydrogen/electron transfer from a given antioxidant to DPPH. The DPPH has a strong absorption band at λmax = 517 nm with deep purple color, whereas the redacted product is yellowish without any absorption band (Lu et al. 2017). Although DPPH-H is the final product, other complexes could be formed by reacting DPPH and oxidized intermediates in the extract and generate high molecular weight polymers (Pedan et al. 2016). The results from antioxidant property of the extract revealed the radical scavenging of the aerial and root extract of C. heratensis. Figure 6 shows the curve of inhibition percentage of the extract versus extract concentration as IC50 (mg/mL). As shown in the figure, the extract of aerial parts (11.92 mg/mL) exhibited higher scavenging activity than the roots extract (63.44 mg/mL). According to the definition of IC50, the lower IC50 value refers to a stronger antioxidant activity in a testing sample. Thus, aerial parts of the plant have higher antioxidant activity. Figure 7 shows the UV–Vis spectra of DPPH solution before and after the addition of the aerial C. heratensis extract. 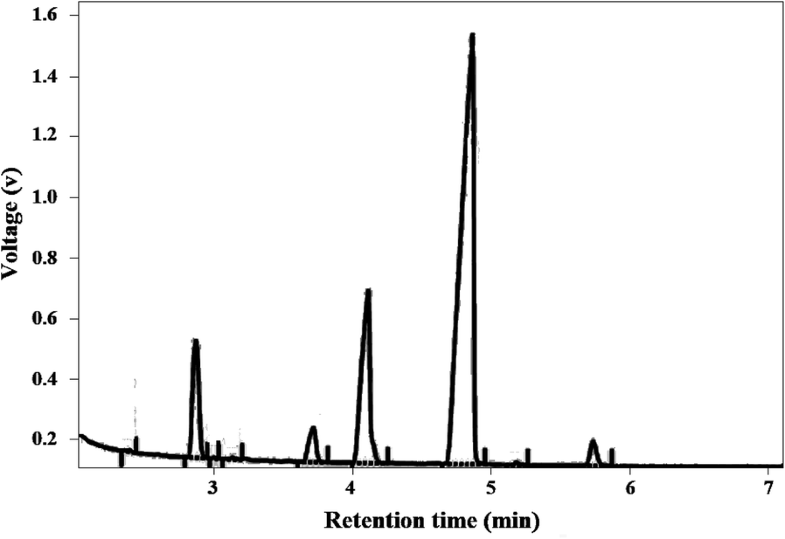 The spectra clearly demonstrated the antioxidant activity of the extract with the complete elimination of the absorption band at λmax = 517 nm for DPPH (Fig. 7a). Figure 7b shows UV–Vis spectra recorded for aerial parts of C. heratensis extract. Electronic spectra of the extract showed one absorption band at ~305 nm (Fig. 7b). The C. heratensis from Capparaceae family is found mainly in the eastern region (Birjand) of Iran. The seed oil of this plant (27.47%) is a rich source of unsaturated fatty acids (87.8%), especially linoleic acid (67.8%) and oleic acid (17.8%). The highest total amounts of phenolic (16.915 mg TAE/g DM), flavonoids (4.444 mg RE/g DM), total tannins (12.231 mg TA/gr DM) and proanthocyanidins (4.086 mg TA/g DM) components were detected in extract of aerial parts in fruiting stage and seed of the plant. Also, the most amount of anthocyanin (0.48 mmol/gr WM) was observed in flowering stage. Harvesting C. heratensis at the fruiting stage and extracting of aerial parts of plant or seeds by acetone give the most amounts of bioactive compounds. C. heratensis extract is a good natural antioxidant that could be added as a chemical basis in food and therapeutics. MAN and AA design the study. SB and MK performed the research experiments, acquired the data and wrote the manuscript. All authors were involved in the analysis and approved the final manuscript of publication. MAN and SB interpreted the results. All authors read and approved the final manuscript. The authors are thankful to Research Council of University of Birjand for providing all the necessary facilities to carry out the research work. All data that are relevant to the study are reported within the article.